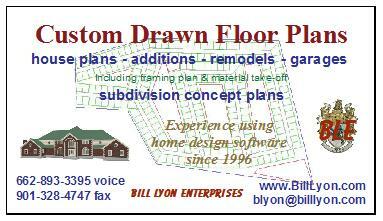 What are Custom Drawn House Plans? Custom drawn house plans start from scratch...a blank sheet, no walls, no floor, no anything...until you convey your ideas for the floor plan layout. This will give you the design you want, rather than trying to modify stock house plans to suite your needs. My typical job costs around 45¢-65¢ / square foot. I charge by the square foot and by pre-set prices for specific items, NOT by the hour, so you have a very good idea what your house plans will cost before work begins. I have never charged extra for re-drawing the *interior layout. Don't feel uncomfortable if you ask to have your floor plan changes made a half-dozen times. This could likely be the biggest investment of your life, and you should feel comfortable making the changes you feel necessary to get your custom house plans drawn right for you. For one of the most ecologically friendly and energy efficient house plans, consider designing your custom floor plans using ICF (Insulated Concrete Form) walls. These homes actually 'wick' the ground temperature up your outside walls to provide tremendous savings in your utility bills, not to mention the security offered from tornados and hurricanes. For more information on this and other innovative ideas visit the 'Construction Links' page. 1. Collect the $65 Setup Fee (I invoice through PayPal) This isn't really a step…but it is when the process starts. Using your sketches or drawings, I will create the outside walls and enough of the inside walls so that we have a rough starting point for the floor plan layout. At this point there may be a few doors, but likely no windows, kitchen cabinets, patios, balconies, etc. You will view your plans using the Chief Architect Client Viewer, after you install it on your computer. I will continue work on the plans, moving walls, placing doors, cabinets and finally the windows. You will receive the plans at several intervals to review for your approval and changes. We will continue to do this until the floor plan is laid out to your satisfaction. Don’t feel bad if you ask for changes a half dozen times…or more. This is an investment you will likely live with for many years to come. After you have approved the final floor plan layout (all floorplan changes stop) I will begin work on the roof design. Roof changes can be very time consuming, so the number of changes to the roof line should be limited to one or two to remain within the current pricing structure. After the roof design is finalized we will begin placement of the electrical outlets, switches and fixtures. Minor changes to the plans can be made that do not modify any walls (other than window or door changes.) When the roof is done we will place electrical outlets and light fixtures. This is the most time consuming part of the process for me. Here there is usually no need for your input. I will disappear for a couple of weeks or more. When the plans are complete and ready to send to the print shop I send you the final invoice. After receiving final payment the plans will be printed and shipped to you.